What it’s about: The true story of Captain Richard Phillips and the 2009 hijacking by Somali pirates of the US-flagged MV Maersk Alabama, the first American cargo ship to be hijacked in two hundred years. Review: I literally don’t know what to say that will do this film justice. In fact I’ve been sitting here staring at a blank screen for 20 minutes because I don’t know where to start. Very few films make the category of, ‘Everyone must watch this film at least once in their life’. Very few are actually worthy of being in that category but after watching Captain Phillips I would urge everyone in the entire world to watch it, at least once. 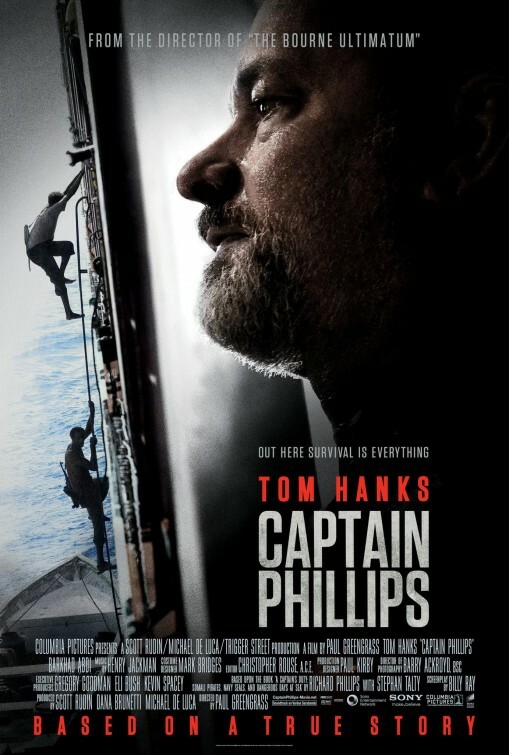 Captain Phillips is based on the true story of Alabama’s Commanding Officer, Captain Richard Phillips who’s unarmed cargo ship gets targeted and hijacked by a group of Somali pirates. 145 miles off the Somali coast, Phillips and his crew endure a stand-off between the pirates and their Captain, Muse who then threatens and tricks the Captain into even more danger. “We have been boarded by 4 armed pirates” is a line that made shivers ran down my spine. The lead up to the pirates actually boarding the ship is so intense and I couldn’t help but notice how much of a part the music played in making these scenes so powerful and distressing. It complimented every scene perfectly. The character of Captain Phillips was played by Tom Hanks with such grace. His character was a leader, he knew what he was doing and wanted to get the job done – no funny business. He was brave, humble and although he is equally as petrified at what is happening, he handles the situation with such dignity. You can tell as the film goes on he’s losing his power in the situation and losing his outward demeanour and he plays both of these emotions perfectly. All the actors who play the parts of the pirates are incredible, absolutely incredible and Barkhad Abdi, who plays Muse the Somali Captain who won best supporting actor at the BAFTAS a few weeks ago was so worthy of that award. A completely stunning a mesmerising performance from all those involved. This film was so natural and effortless, despite it’s nature. It was mesmerising, addictive and it really does take you through a journey and an excellent portrayal of incidents that do happen. I frequently kept having to remind myself it was based on a true story. Near the end of the film when the situations has gotten too out of hand for them to handle themselves the US Navy get involved and it really did leave me with the utmost respect for the soldiers who actually have to deal with these situations. The progression in this film was phenomenal and the ending was so surreal and extreme and my heart ached for Phillips. Hanks is one of the best actors of our time and absolutely no body else could have portrayed the fear, bravery and nobility as well as he did. It truly was the performance of a lifetime. Great review Jenny! I didn’t love it as much as you, I think it had been hyped so much by the time I saw it that it fell a bit flat. Not to say it’s not a great film though because it is. Funny you should say that because I heard very little hype about it at all! Just the odd person saying it was good but other than that, nothing! Hmm. Oh my God yeah I remember hearing that somewhere too! To be fair, I’d be nervous around Tom Hanks as well, he’s incredible! I’d be totally star struck! Thank you, it was an incredible film, not enough good things to say about it! Nice review! It was a shame Hanks was overlooked this year at the Oscars for this performance. He was brilliant.